Me either, but hey, it's there if we do. 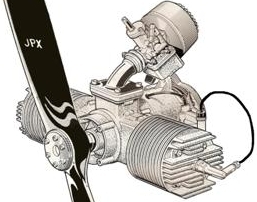 You should start a new topic like "New Throttle assemblies available"
It might get more notice. Thought I would add another shot in-flight. The Tach cable routing is going to be changed to follow the fuel and throttle cable. The supplied wire was about 4 or 5 feet long and they say a max of 8 feet work. Paul Grandal has a longer wire set up on his tiny tachs, so I'll try to see if the same works for the "SenDEC" tach I have (available from Wildfire). I put nitro in the fuel. It's turning 10,000 rpm! Just kidding. I'm around 1000 feet if I remember right. You can see there is a wind by the way the pull cord handle is blowing back, and the shiny blur near the spinner base is actually the backplate showing behind the prop. I'm still using my old spinners that don't have any gap covers. Completed the tachometer installations. Routed the wires along the fuel and throttle cable, then fwd along the fuse tube, running it inside the bracket to keep them out of the way of my helmet. The SenDEC tachs still work properly with 7 feet 9 inches of wire on them. I purchased a spool of some standard type 20 awg. wire which fit in the sensor slot in the back of the unit. Went up today for another 1.2 hours. Shannon wrote: To pull the rear bearing you need a "Bearing Splitter" and two-leg Flywheel puller.